Informative post and many thanks for the hat-tip. I must admit my financial life is feeling pretty darn good at the moment. Like you I have no intention of buying an annuity (at least for a good many years, I do think they may have benefit as insurance if you're quite aged and your portfolio is below what it should be at that time) and like your good self my portfolio will change pre and post-FIRE but by surprisingly little. Your "what is a sustainable longer term drawdown rate?" question is a good one and one I have been pondering and researching for a long time now. 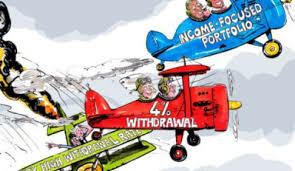 As you know for a UK investor I think 4% is too bullish and I must admit I'm still happy with my 2.5% of starting wealth ex investment expenses but not more than the dividends with the option to then increase spending by inflation annually. Yes, I am sure it must be a good feeling right now! After the announcement by BofE this week - reduce bank rate to 0.25% and more QE (which never seems to get where it's needed), annuity rates will be hammered and those who have been prudent throughout their working lives will be scratching their heads wondering if it was all worth it...don't get me started! The 4% SWR is probably a good starting point which obviously needs to be tailored up or down to mesh with each individual. Whilst it may suit me with maybe 20 yrs to eek out, with 40+ years of retirement, I guess it makes a lot of sense to start off with the lower rate and see how things develop. I look forward to following the next chapter in the FI story. "Most people will probably need less income in retirement than when working"
I see this written often but dont understand why people think this. If I'm in the office or otherwise working in a factory or a building site or shop or wherever, I'm not heading off on holiday where I'll be spending (and where I've spent to get and stay there), I'm not walking into town and eating lunch in a local cafe nor have I paid an entrance fee to somewhere and then had lunch there either. I've got no restrictions on how many holidays I can have nor how many days out I can take. Bottom line, there's substantially more time in which to spend money once you're retired. Unless commute costs are huge, what is it you are saving by not working? Or is this done on the expectation that your "spending" includes things like paying into a pension? I suppose many people think this because it is the reality. You lose all the expenses of work - commute, lunches, clothes etc. etc. Hopefully you will have paid off the mortgage and other loans which can be a big item. Any children will have moved out and of course there will be no more saving into a pension or ISA for retirement. Leisure time can be expensive if that's what you desire...equally it can cost little, for example walking, voluntary work etc. I imagine many people will have some idea of what they want to do when they retire (early or not) and what the costs are likely to be and will have planned their savings and pension accordingly. Maybe I'm an edge case then? "You lose all the expenses of work"
- lunches = If at customer or out of office, free (expenses) if in the office my subsidised office restaurant is cheaper than I'd spend in a cafe in my local town. Many people take packed lunches anyway - indeed thats what most money saving websites would tell you to do. clothes = a suit and few shorts every now and again? I'd still need shirts. etc. etc. - "etc etc" dont take any offence but thats a cop out. DOnt we need specificity if we are managing our finances? "and other loans which can be a big item." What are these "other loans" that apply when working but not when retired? Any children will have moved out and of course there will be no more saving into a pension or ISA for retirement. TRue but much of this ought to be true in say the five - ten years leading up to retirement oughtnt it? Its not like at age 65 all that immediately stops. It should have been phased out because its too difficult to time it like that. I can certainly say for me, with a year or so to go, the one thing currently holding back my opportunity to spend is being at work. The one big ticket item i've identified is only need to run one car but even then the second one is a sunk cost. Wont need to buy a replacement second car in say 10 years time perhaps. Of course, not ALL spend less - some people may spend a similar amount in retirement as when working! A very helpful post ! I have recently switched by SIPP contributions from Lifestrategy 60 to one of the target retirement funds, you mentioned, basically because Vanguard will slowly at no cost to me move the balance from equities to bonds. I don't trust myself to make good decisions around timing that myself so far better to leave it to an automated vanguard bot to take care of. Still have a few years to get to my number so will continue monitoring your blog and others for tips strategies and inspiration keep up the good work ! The Vanguard TRFs are a useful addition to complement the Lifestrategy options. However, when I looked into them a couple of months back they were restricted to a handful of platforms. Good luck with achieving your retirement target and good to hear you were helped along by the post! Interesting what 'Unknown' has flagged - I do think that in most cases, you will spend less when retired than when at work. But as he (I'm assuming he as he talks about shirts) says, when retired, there will be a lot more opportunities/spare time in which to spend more money. When working out my own 'number', the income that I am hoping to retire on is actually more than what I currently spend/live on, as I have tried to take into account new hobbies, travelling opportunities, increase in gas/electricity bills as I may spend more time at home. I suppose the difference would be that for someone saving hard in order to have the option of an earlier retirement, it is very likely they will be spending more later. However the majority will not be saving 50% of earnings, maybe 10% at most, working longer and will probably spend less in retirement. I agree that for some, more leisure time = more spending and some will inevitably spend more in retirement. It would be good to see some stats on this..maybe the ONS Family Spending survey will show some relevant figures? The late Steven R Covey suggested we "begin with the end in mind". The starting point before any investing (asset allocation, funds, drawdown strategy etc) surely has to be to first carry out a detailed lifetime cash-flow (proper planning) of your income and capital needs throughout the rest of your life e.g. to aged 100? No two investors needs are the same - it comes down to what lifestyle you want - big lifestyle needs big number , small lifestyle needs smaller number. Check out Enough? book by Paul Armson on Amazon.There is a DIY free cashflow tool in there (although knowing what to do with the results is another thing entirely). Average life expectancy can be misleading too. How many go beyond the average? Half? It is worth employing a lifestyle financial planner (Google it) to create a Plan for you - you can DIY here but great danger lurks - whom will challenge your assumptions or keep you in your seat when markets fall 30%? If providing for partner/spouse then its whom is likely to last the longest? The new pension flexibility in the UK from April 2015 means that very often the very last asset to be spending down should be the pension fund as its usually 100% free of inheritance tax on death. There are many different pension drawdown strategies. Maybe using tax free cash and phasing that in as 'income' is better than taking taxable income - maybe its a combination? Keeping a years' worth of fees/income in cash and replenishing can work (drag on cash vs pound cost ravaging). I'd always do the proper planning first - before the technical stuff. After all, if you don't know where you are heading you might not get there! ps from experience, after aged 80/85 discretionary spend on holidays etc falls off a cliff so perhaps you need more capital/income in active retirement than later? A lifestyle financial planner can help here and perhaps save you from yourself.